Summer has finally arrived. Isn’t it funny how we complain about the cold and snow for so long throughout the winter, but, when the heat and humidity of summer hits us. we complain about that too. I know that I am guilty of that; yet in the summer I can escape by finding the coolness of air conditioning. Yet, even if I need a light sweater, I can enjoy the coolness. When winter snow arrives, I have no choice but to go out in it, shovel, drive, trudge through slushy, sloppy parking lots. For sure, there is no escaping it! I would certainly choose the beauty of summer, the green grass, the colorful flowers and being able bask in the sunshine. Yes, I love it! 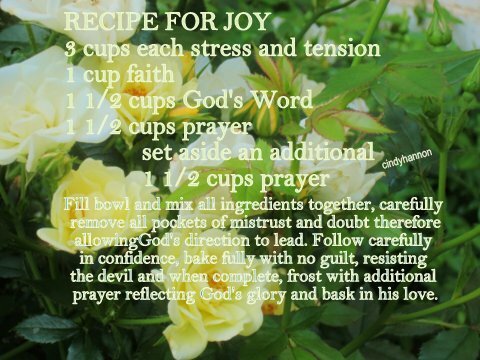 As a Christian, I have him in me, his joy is in me ~ regardless of my outward circumstances and what is going on in my life! Prior to these words, Jesus also told us to abide in his love. If I am going to stand by, or act in accordance with His love, I must embrace his love. It is then when his joy will have a marked influence on my attitude and actions. He, being in my heart, will rule not my circumstances. Joy is within! My choice is whether or not I will live in that joy or live in my stress. If you feel like your being pulled in too many directions, maybe it is time to unclutter your mind and your heart. soak in his love, soak his words to your life. As you do that, consider your blessings, consider what he has done for you out of love. Lift up the name of the Lord in worship and with deep gratitude for who he is and what he has done in your life. The stresses and tension you were feeling can be flooded over with his love. Take time to slow down this summer and besides basking in the sun, bask in the Son! I hope you enjoy this song by Gwen Smith. Take time to reflect on it and consider the words as you consider how you can bask in the son more this summer.